** When first accessing your account: If you have submitted a registration form to our office, your information has already been entered and can be accessed by clicking login (1) and Click Forgot Password? (2) The program will then prompt you to enter your email address and your password will be emailed to you (the email address for your login will be the first (primary) one that was written on your registration form). 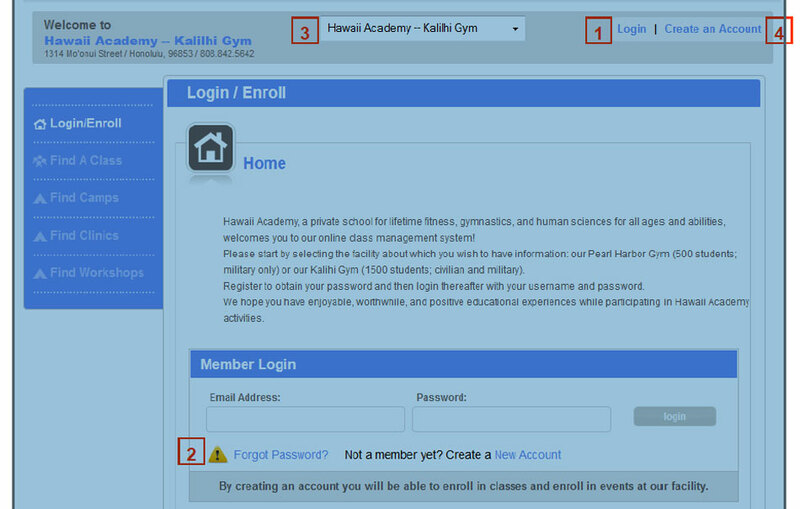 If you do not know which email address was used, or wish to change your email information, please call us at 842.5642 (Kalihi Gym) or 422.2223 (PH Gym) and we can assist you. If you have never submitted a registration form, click Create an Account (4) and fill out the registration page (please note that you will also need to fill out the physical registration form as well).